Abul Bashar is a powerful young writer who has long been thinking about the problem of Muslim conjugal, jouno reform, his love-hate conflict and dynamism. He has been trying to look at this diverse issue from different perspectives through his many small and big stories. The whole form of this endeavor- 'Phulbou'. Fill with 'Agene-divorce-polygamy' and it is a brave, memorable and important action to judge Muslim life in the context of modern and modern values. 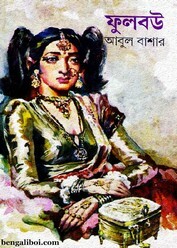 May be remembered that, this novel first published in Sharadiya 'Desh' Magazine and then the novel exploded in the reader's mind. Collect and read the book from pdf. The ebook- 'Phulbou' has 208 quality pages, 13mb file size. Courtesy by- Yeadira Amran, boier hat.